alaTest has collected and analyzed 50 reviews of Pasquini Livia 90 Automatic Espresso Machine. The average rating for this product is 4.4/5, compared to an average rating of 4.4/5 for other products in the same category for all reviews. Views about the maintenance and durability are on the whole positive. The capacity and design also get good feedback, but there are some critical comments about the noise and size. We analyzed user and expert ratings, product age and more factors. 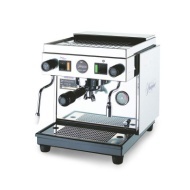 Compared to other products in the same category the Pasquini Livia 90 Automatic Espresso Machine is awarded an overall alaScore™ of 78/100 = Good quality. Worth every dime, and every dime I've spent on it since. I decided to write this review because I've had my semi-auto Livia for two years and I noticed that many of the reviews available on the site were written after a realitively short period of acquantance with a new machine. I couldn't be happier with this machine. I get great espresso any time on-demand. 25,000 shots later, still going strong. This review updates a previous review posted more than four years ago. Avoid Pasquini, and avoid Aabree Coffee Co. Simple design. High pressure. Should be able to make a good espresso. Design faults. Bad web vendors jobbing out to third parties. No QI. Dishonest service. Beware! There have been many positive review written about the Livia and this is another.